Simon Russell Beale, Ben Miles and Adam Godley in The Lehman Trilogy at the National Theatre. Photo by Mark Douet. Following a sold-out run at the National Theatre, the NT and Neal Street Productions’ critically acclaimed The Lehman Trilogy will transfer to the Piccadilly Theatre in May 2019. 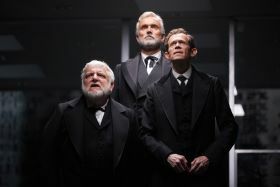 Simon Russell Beale, Adam Godley, and Ben Miles will reprise the roles they originated at the National Theatre in The Lehman Trilogy by Stefano Massini, adapted by Ben Power and directed by Sam Mendes, when it transfers to the West End from 11 May 2019, for a limited 12-week season at the Piccadilly Theatre. Tickets for the transfer go on sale to the public from 2 November following a members’ booking period. The Lehman Trilogy is produced in the West End by the National Theatre and Neal Street Productions. Directed by Sam Mendes (The Ferryman, Skyfall), The Lehman Trilogy weaves through nearly two centuries of Lehman lineage. On a cold September morning in 1844 a young man from Bavaria stands on a New York dockside. Dreaming of a new life in the new world. He is joined by his two brothers and an American epic begins. 163 years later, the firm they establish – Lehman Brothers – spectacularly collapses into bankruptcy, and triggers the largest financial crisis in history. Simon Russell Beale, Adam Godley, and Ben Miles play the Lehman Brothers, and a cast of characters including their sons and grandsons, in an extraordinary feat of storytelling. The Lehman Trilogy features set designs by Es Devlin, costume design by Katrina Lindsay, video design by Luke Halls, lighting design by Jon Clark, and music and sound design by Nick Powell. The music director is Candida Caldicot, with movement by Polly Bennett. The world premiere of Stefano Massini’s The Lehman Trilogy opened at the Piccolo Teatro in Milan in 2015. It turned out to be Artistic Director Luca Ronconi’s final production before his death. A long-term admirer of Ronconi’s, Sam Mendes was inspired to begin planning an English adaptation for Neal Street Productions. Ben Power, Deputy Artistic Director for the National Theatre, was commissioned to create a new version of this epic play, using a literal English translation by Mirella Cheeseman. The Lehman Trilogy transfers to the West End direct from the production’s New York debut, complete with the original cast, at the Park Avenue Armory. The Lehman Trilogy previews at the Piccadilly Theatre from 11 May 2019 and follows the National Theatre’s production of The Curious Incident of the Dog in the Night-Time at the venue, which opens in November 2018.